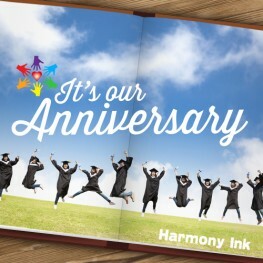 Harmony Ink Celebrates Our Third Anniversary! Happy Anniversary to Harmony Ink Press. We're celebrating all month with some amazing sales and special events! You won't want to miss what our authors have to say about Prom, what they are "Most Likely To" or what they'll celebrate for Spirit Week (hint: we love books!) and some of our favorite inspiration quotes to keep us motivated to read and write! Check in all month at harmonyinkpress.com!